At Faith Community, our mission is to make more and better disciples of Jesus Christ, and we want to follow Jesus’ example. We want to make disciples who make disciples. We offer occasional discipleship workshops, such as this one, that offer ways for each of us to be equipped for discipleship as we go about our lives every day. 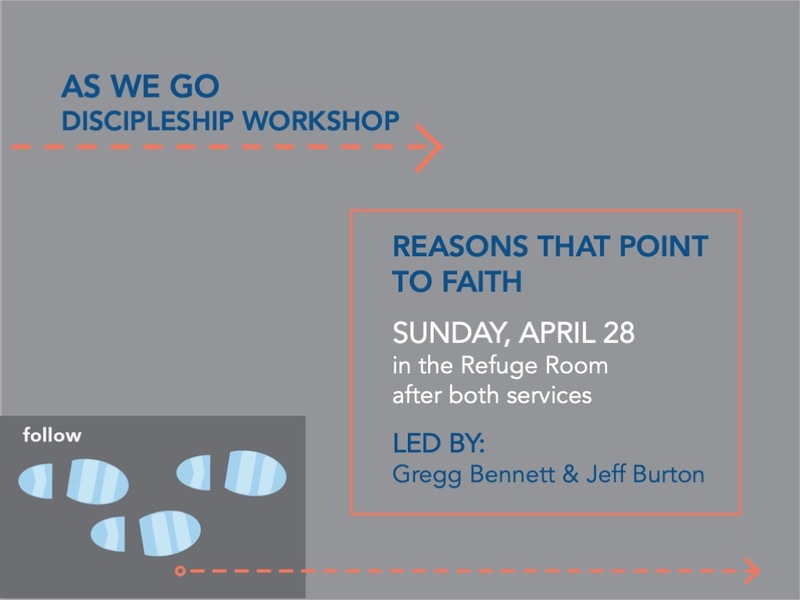 We’re offering our next As We Go Discipleship Workshop after both services on Sunday, April 28. It's called "Reasons That Point To Faith: Compelling Explanations for the Existence of God and the Resurrection of Jesus." Belief in God and the resurrection of Jesus from the dead requires faith. The question of how rational and reasonable the nature of such faith is has been debated by mankind for literally thousands of years. This workshop will interact with some of the compelling facts, evidence, and rationale that strongly support a justified belief in God and the resurrection of Jesus. Scientific, moral, and biblical evidence will be utilized and drawn from short videos available from ReasonableFaith.org. It is hoped that those participating will come away encouraged and emboldened in knowing how strongly recent evidence from modern science supports ones belief in God and how that belief in turn strongly supports the most logical explanation that God raised Jesus from the dead. The tools used are publicly available and should be useful for those interested. Time for questions is planned, welcomed, and encouraged! AND there’s no cost for the workshop, and no need to register!